What will my word search look like when I print it? Why choose My Word Search? A subscription to make unlimited word searches costs $5/month, or $4.25/month when billed annually. You can try it free for 30 days before deciding if you want to subscribe. Click the blue “Choose Plan” button on the left when you are ready. Individual word searches can also be purchased for special events. Do you offer crossword puzzles? Check out the crossword puzzle maker at our sister site, CrosswordHobbyist.com. You can also buy a joint subscription to both sites for a 20% discount when you sign up for a plan. Click the blue button next to the big “3” on the left when you are ready. You will be prompted to create an account if you haven’t already, and then see payment options. Once paid, that button will turn into a 'Publish' button that will put your word search in a format that can be printed or solved online. Yes. All word searches created with the word search maker are saved to the cloud and accessible from any computer when you log in. Where are my saved word searches? When logged in, click on the 'My Puzzles' link in the header to see your word search or create a new word search. 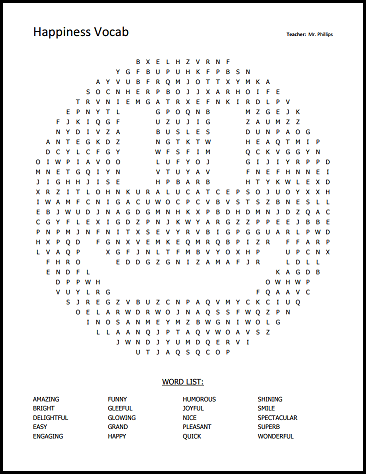 Word searches you are working on can be found in the “Word Searches I’m Making” section, and word searches you’ve completed can be found in the “Word Searches I’ve Published” section. Can my word search be solved online? Yes. All word searches receive a permanent link, and you can share the link with your solvers so that they can print it or solve it online. Can I give my solvers clues, instead of a word list? Yes. Click on a word in the word list at the right of your word search to write a clue for it. You can create Spanish word searches using the Spanish word search maker and French word searches using the French word search maker. Change your language in the 'Customize' section. Can I keep my word search private? Yes. When you finalize your word search, you have the option of adding a password. You can keep this password private or share it only with your designated solvers. Do I own the rights to my word search? Yes. My Word Search will never make money from your work. Bloggers get free access to My Word Search. To get blogger access, email [email protected] and include a link to your blog for approval. Can I embed word searches in my website? Yes. Word searches you create and publish on My Word Search can be embedded and solved on YOUR site. Here are some super-easy instructions to embed a word search in your site.